WATCH OUT – Super Black Monday – Bank Of America’s JP Morgan And Morgan Stanley Outsized Exposure to the U.K, $150 Billion In Quant Selling Over The Next Three Days. 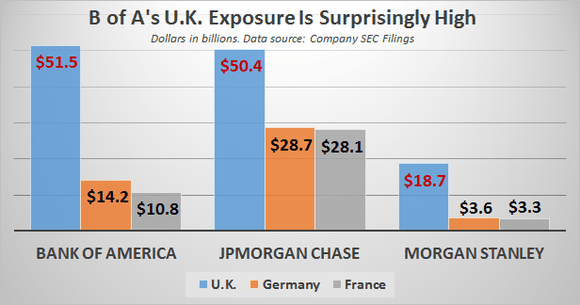 As the chart below demonstrates, Bank of America’s exposure is quite high in the United Kingdom — considerably more than the investment bank Morgan Stanley (NYSE:MS), and greater than even JPMorgan Chase (NYSE:JPM). DATA SOURCE: COMPANY REGULATORY FILINGS. This is another great article by Ben Hunt of Salient partners. I keep quoting this man, because I like how he thinks and writes. So, of course the EU has to punish the UK. The real danger here is stopping other people in other countries from thinking along such dangerous lines as believing one has self-determination, for example. That nonsense has to be nipped in the bud. But can they? Can they make enough of an example of the UK to deter other people in other countries? Even if they can, can they do it in time? That I am not sure about. You can be sure that given the emotions, the egos and the power involved, we should expect some really bad behavior on the part of the power structure. You know, to punish those striking mine workers, er, I meant British citizens. Maybe mortgages becoming really hard to obtain, or business lending to small and medium sized enterprises drying up. You know, along the lines of the local school board cutting the most popular programs when they don’t get the entire 5% budget increase they asked for. Petty point proving, the pettier the better. At any rate, expect the rescue attempts to already be unfolding. Merkel, Renzi, Hollande to meet on Brexit Monday:: 3 out of 27 members decide!!! 24 country members not on this meeting!! !